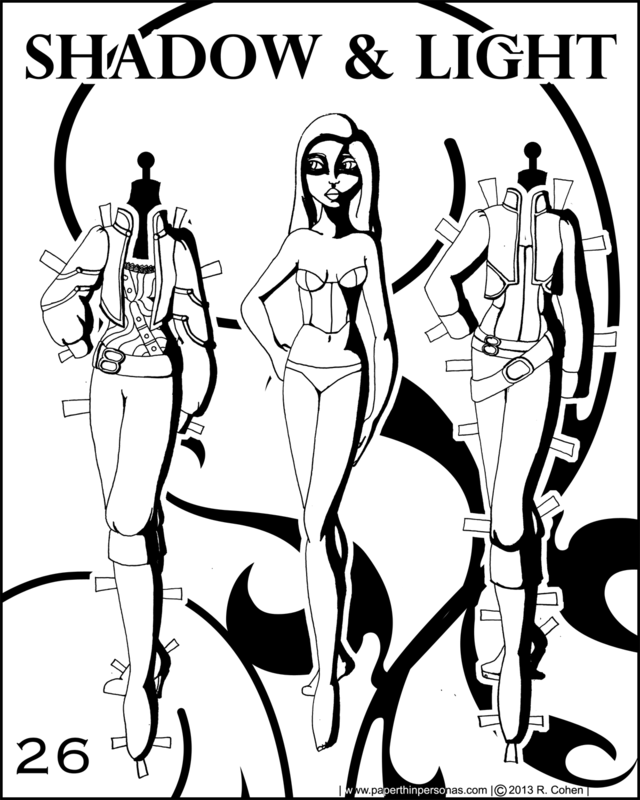 So, this printable paper doll set was inspired by the Avengers. Not the Marvel comic book ones, but the original Avengers from the sixties by BBC. I got into that show because a high-school friend’s mother was totally into it. I thought that Emma Peel was the most elegant woman I’d ever seen. Actually, I still kinda think that. Also, who doesn’t love 1960’s inspired jumpsuits? I have to confess that I am neither pleased with how the “logo” image looks nor am I entirely pleased with her hair, but life is short and I wanted to get her posted up into the world. I am trying hard to end the year a little more on track that I was last year, so that means getting my paper doll life organized. What I don’t want to do is end the year with a lot of random old scans cluttering up my folders. I have scans from years ago that I’ve never finished or posted and they sort of stare at me every time I open the folder with guilt inducing looks. “Why haven’t you posted us?” They ask. Nothing is worse than being guilt tripped by your own artwork. By the way, if anyone is thinking of starting a blog, I think that While She Naps (A blog I like about sewing stuffed toys which I don’t do, but someday I might… okay, probably not, but I still like her blog) did a wonderful post I recently stumbled across called Nine Reasons Why You Should Have A Blog. One piece of her advice I need to learn to accept better is… It’s okay if a blog evolves. I have trouble with letting my blog evolve. I need to get more accepting of the idea that evolution is natural. Have something to tell me? Feel free to leave me a comment. Wow, it has been a long time since I’ve done one of these paper dolls and I have missed them. I developed drawing in this style in college, because I admired the work of many wonderful comic book artists. As I got more concerned with the playability of the paper dolls rather than what I thought was artistic merit, I largely abandoned it for paper doll work and went back to my more cartoony style. 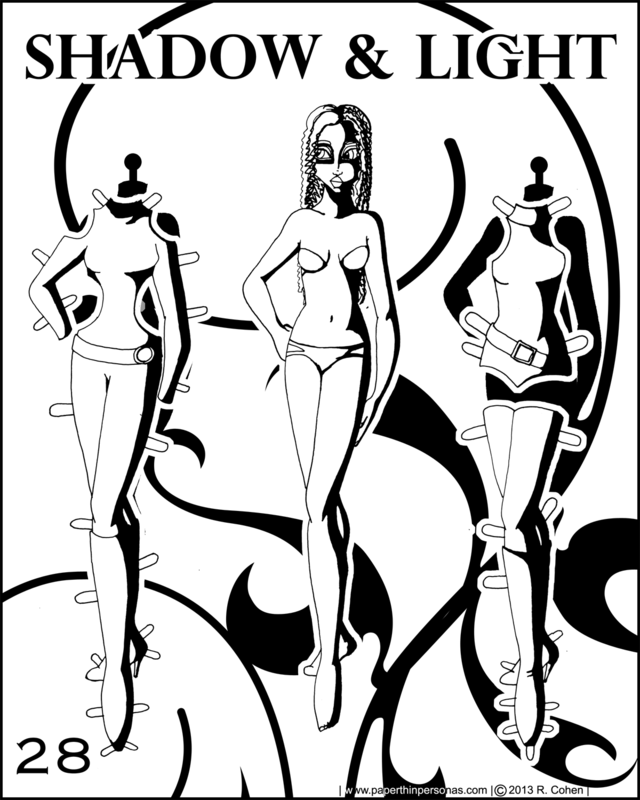 Still… I love the idea of black and white paper dolls that aren’t meant to be colored and can stand alone as pieces of work without needing color. 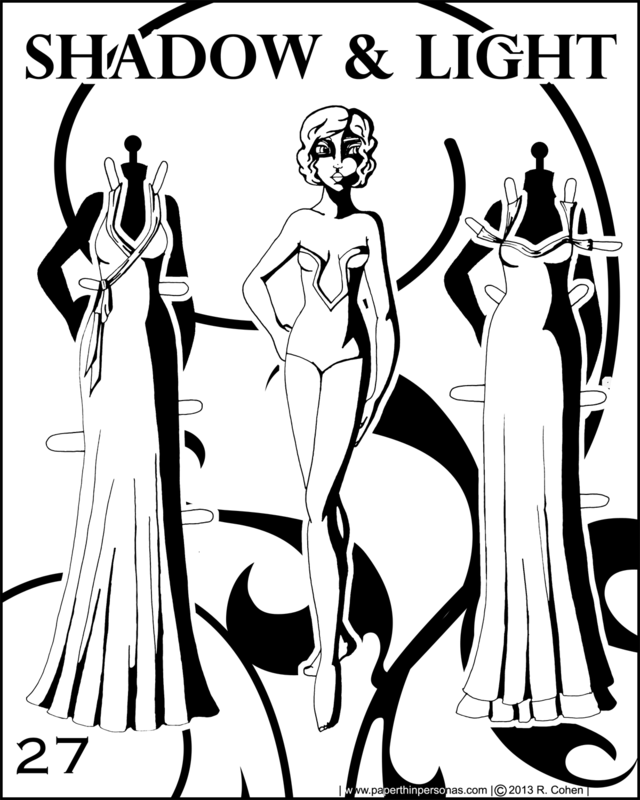 Today’s Shadow & Light printable paper doll has a 1930’s noir sensibility that I think the heavily shadowed medium really illustrates well and I adore her side glancing eyes. One of the other reasons I love doing Shadow and Light paper dolls is that they come together very quickly. 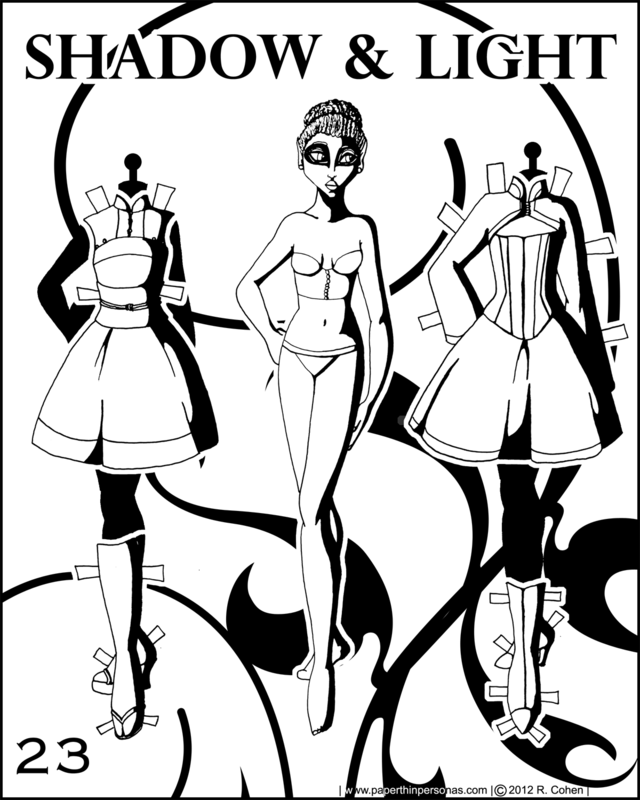 Well… not the inking and drawing parts (those take more time with all the shadow), but the actualy formatting is quick since they don’t need to be colored and usually I draw the taps right on the paper doll clothing rather than adding them later. By the way, I have a new poll. I have done this poll once, several years ago. That time, the Marisol Monday won out, by a landslide. I’m curious of that would happen again. I suppose we’ll see. I shall confess openly that I chose to rather than finish my Marisole paper doll for Monday I went out and had drinks with some friends. I think I had more fun with the drinks and burgers than I would have had with the paper doll, though I always value the opportunity to work on paper dolls. It was a busy, but weirdly unproductive weekend. So, yesterday evening, after I got home from a panel on slavery and christian thought in the 1860s (which was fascinating, by the way), I settled down to watch something mindless on television (I have an odd addiction to HGTV) and work on this paper doll set. This brings us rather neatly to today when I uploaded my files and posted the paper doll. Every printable paper doll I make is a little different. In today’s paper doll set, I wanted to create some historically inspired (Tudor-lite) dresses that would feel like they could have actually existed, though obviously they did not. There’s a bit in the film Enchanted where the character goes from the cartoon fantasy world into the real world and suddenly the inherent absurdity of the huge skirted dress she is wearing becomes obvious. I bring this up, because sometimes I feel like fantasy costumes are absurd for the sake of absurdity. There is nothing wrong with giant skirts. 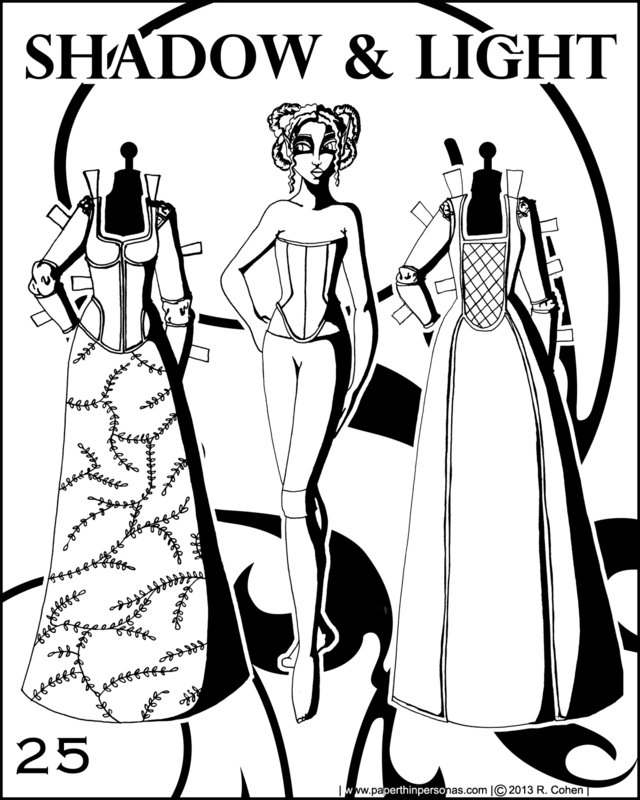 But this set of paper dolls, I found myself thinking of the stiffer conical skirts of the tudor period (thanks to the farthingale) rather than the softer styles I usually favor. The hair owes more to the Rudi Gernreich and Givenchy of the sixties than to anything older. By the way, I have been looking for a really stellar book on the sixites mod fashions, if anyone knows of one, I’d love to get the title. The few I have found have all been lackluster at best. I’ve done a lot of futuristic posts over the years. Some I think have been more successful than others. I still consider Shadow and Light Paper Doll 1 to be one of the best in this genre, even if most of her costuming was inspired by Cleopatra 2525. It was free on Hulu and I didn’t have cable. Don’t judge me. My idea with this paper doll was do show off some more “casual” sci-fi inspired attire, but in the end I think it’s a little uninteresting. If I’m not careful, and I don’t know what to draw, I tend to draw the same things over and over again. I think these pieces are to close to those worn by Marisole Monday when she was an alien. Despite my mixed feelings, I am posting her today, because I think it is important to put up what I have finished, even when I’m unsure about it. As I’m sure I’ve mentioned before, if I only posted what I was certain I liked, than half my posts wouldn’t have ever gone up. So, today I wanted to draw a paper doll that was a little edgy and inspired by Asian traditional dress with obi’s and mandarin collars (though there is some debate as to the evolution of the mandarin collar… and whether it evolved from Chinese contact with European military uniforms or European contact with Chinese dress… I’ve read both versions in respected literature on the subject, so I have no opinion except to say we don’t know and leave it at that), but I realized I tend to draw Asian looking paper dolls when I’m drawing Asian inspired costumes and that seemed a little… odd, so I instead made her an elf with braids, resulting in a sort of African elf in an obi. I’m sure if I was more awake today and if I really wanted to, I could probably read some interesting orientalist thing into all this, but I’d rather just stick with the “it’s a paper doll and it’s neat” side of theoretical endeavors. Anyhow… as you might have noticed on the right side of the blog a few things have changed. I’ve added tags in an attempt to try to create a genre sort of listing which crosses paper dolls styles. So, if a person wanted to see all the fantasy paper dolls or felt a need to look at every blond paper doll, the option would be available. The three tags I am sort of uncomfortable with are Asian paper doll, Black paper doll and Hispanic paper doll. I did them, because I erratically get emails asking about paper dolls of one of those three groups and I thought the tag might help people find them, but I also feel rather uncomfortable applying racial labels to my paper dolls, especially with Marisole who only has two facial options to begin with. 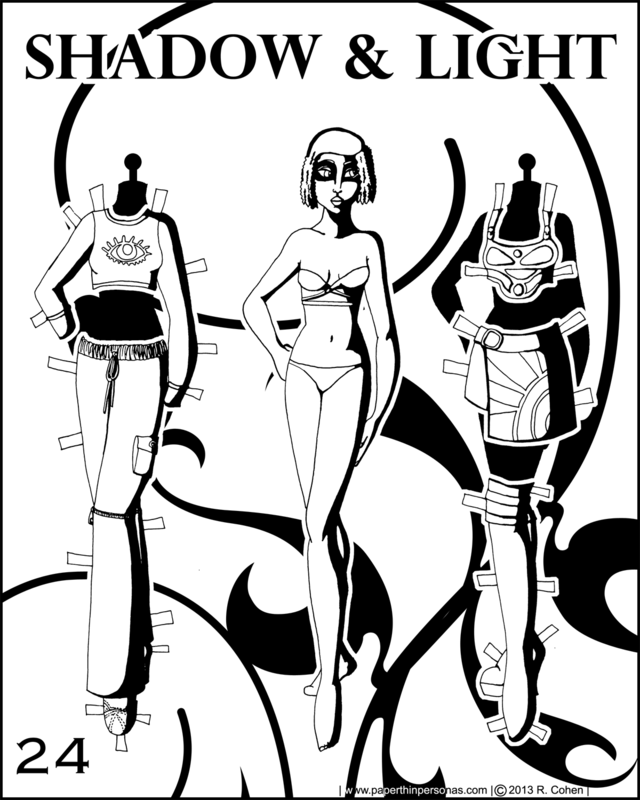 So, I’m tossing this out to the peanut gallery: Asian paper doll, Black paper doll and Hispanic paper doll tags are useful or awkward or likely to offend people? Thoughts? Here we are at nearly the end of December and here is another Shadow and Light paper dolls. Today’s paper doll is a bit steampunk-ish (though lacks the gears and goggles that seem to be required), still I hope no one will hold that against her. Truth be told, I can’t draw a gear to save my life, though I have tried on occasion to mixed success. I forgot, living in Alabama, how pretty the snow is, but I also forgot how annoying it is to sweep off your car in the morning in the cold wearing black ankle boots. Toes freezing and fingers freezing and snow sticking to eyelashes under a grey sky with lights from the buildings flickering through, there’s nothing like winter in Southeast Alaska. It’s a beautiful place up here. Oh and by the way, there’s a poll on the sidebar. Please fill it out. I do actually pay attention to what people vote for and I use it to decide what I will do in the coming year. If there’s something you’d like to see and it’s not on the list, please comment.